I know what you’re thinking – Don’t think that you’ll sit this one out because you don’t usually like IPAs! There are actually a very broad spectrum of IPAs with some pretty amazing flavors, and this may be just the flight to take your palate to a whole new destination. And for those of you hop-heads out there, this is the flight where you can talk hops all evening long and taste some stellar regional examples of IPAs. This month’s forum will take place on Wednesday July 20, 2011, 7:30p-9p at the brewery. The cost of the flight will be $12 and will include a flight sheet, the flight and the best part… some QT with all your new beer-drinking friends! Please rsvp so that we’re sure to have enough beer on hand. Hope to see you all there! 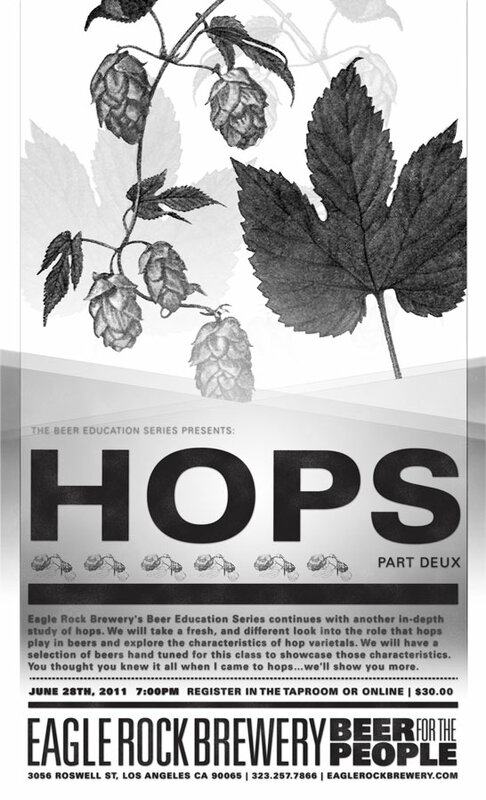 Eagle Rock Brewery’s Beer Education Series continues with another in-depth study of hops. We will take a fresh, and different look into the role that hops play in beers and explore the characteristics of hop varietals. We will have a selection of beers hand tuned for this class to showcase those characteristics. You thought you knew it all when it came to hops…we’ll show you more. The class will take place in the Eagle Rock Brewery taproom on Tuesday 6/28/11 from 7pm to 9pm. As usual, the taproom will be open at 6p for those registered in the class to come in to pickup the course materials and enjoy a pre-class beer. Cost will be $30 per person and registration can be purchased online. Note: Class registration is non-refundable so please do not register for the class until you are absolutely certain that you will be able to attend. No exceptions will be made. The registration does not include a guest, so please do not bring guests with you and expect that they will be able to stay. All of our classes have sold out and space and class resources are limited, so as a courtesy to everyone involved, no exceptions please.